Sadly, TROOPERS 19 is already over. I had great fun meeting all of you, helping you with your badge problems and seeing others hacking on their badges for example to get custom images on there. With this year’s badge we wanted to give you something you can reuse after the conference, learn new things new build something on your own. As promised in our talk Jeff and I would like to give you a short introduction into the badge internals. Along with this post we will release the source code for the badge firmware, the provisioning server and the schematics for the PCB. Troopers 16 – Taking the Badge to yet Another Level! Real men used to wear pink pagers, but that’s the past and recently it was time for Troopers 16. Meaning: Real Troopers wear awesome Badges! And, from the feedback we got, they did! 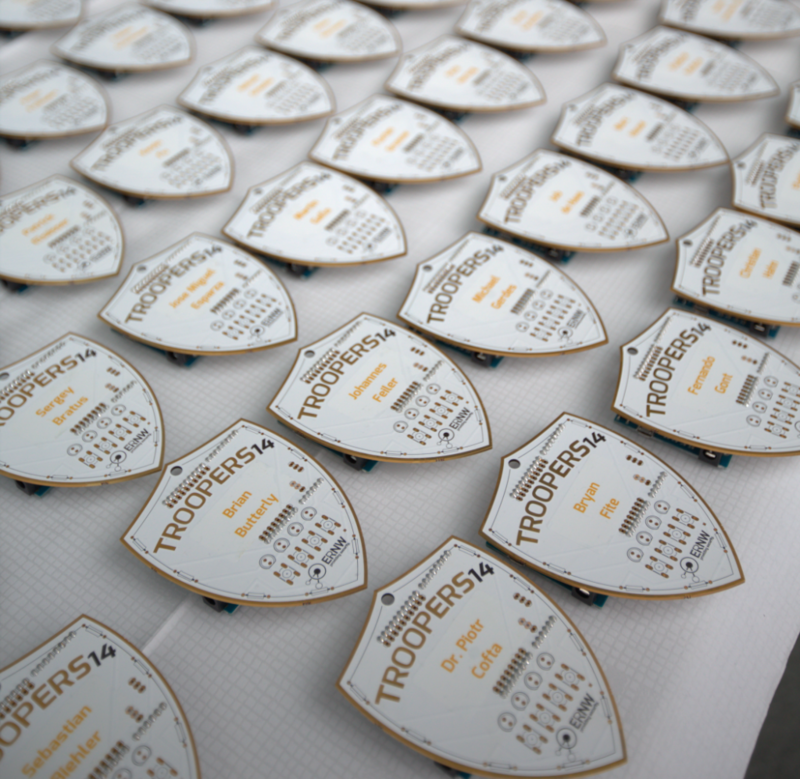 Troopers might be over, but the era of the TR16 Badge is seemingly just beginning. As such, here’s a quick insight into the badge! As TROOPERS15 has come to an end, I’ve finally got the time and energy to give you a deeper insight into the TR15 badge. As most of you have probably heard during the conference, this year’s badge was based on the OpenPCD2. The OpenPCD 2 is a 13.56MHz NFC Reader, Writer and Emulator under the GNU GPL v2. As NFC is, yet again, on an uprise, a badge with NFC simply gives you the chance to fiddle around and hack stacks of stuff in the real world. Adding some TROOPERS spirit and a few little secrets we hope we’ve designed a pretty nice badge! TROOPERS14 has come to an end, and it’s finally time to let you have a go at the Badge’s source code. As promised, it was slightly modified and extended, to show you the full potential of your new gadget. I’ve added some nice payloads from Nikhil Mittal and a few own ones. Above that, for those who took their parts for soldering home, I’ve also added a few quick instructions on how to do the soldering.